I received this recipe from my mom and have always loved this cake. It has the consistency of a mousse, but is really a cake. I think it is halfway between a soufflé and a cake. It has an airy texture and rich chocolate flavor without being too sweet…. so delicious! 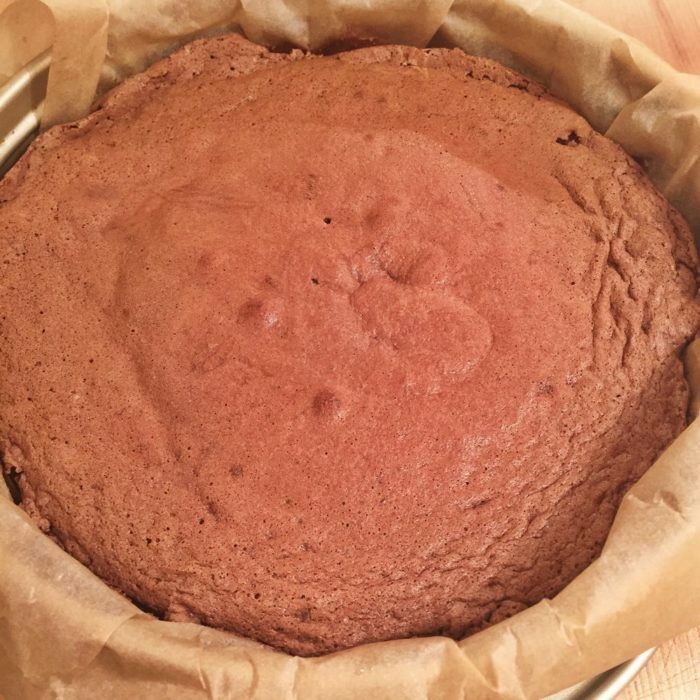 You could use a cup for cup flour to make this cake gluten free. Melt the chocolate and butter together and let cool at room temperature. Separate the eggs and beat the yolks with the sugar until it turns light yellow. Beat the egg whites until soft peaks. Gently fold the egg whites into the chocolate. When combined add the yolks and finally add the sifted flour. Put in a greased round cake pan and bake for 20-25 minutes, it should still be soft in the middlewhich means your knife should not come out too clean… I like it when it is a bit gooey.